Two actors who appeared in SPECTRE have both said they’d love to reprise their roles in Bond 25. 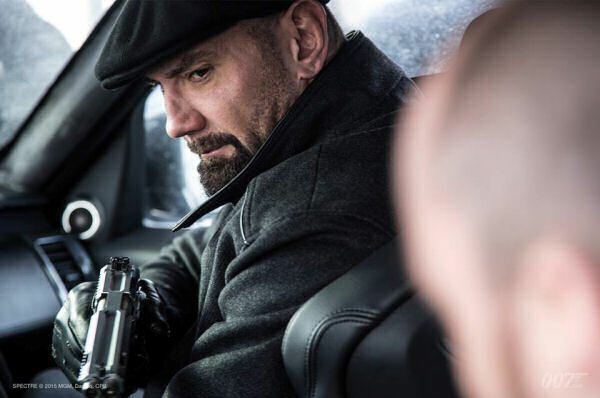 The first is Dave Bautista, who spoke to the Express during the promotion of his latest film, Final Score. We had hopes, and…they had mentioned it. But yeah still have kinda hopes…I hear it’s been pushed, so maybe there’s a…chance. Yeah I want to be in Bond 25. I’ve been very open and political about it. Like I’ve pursued this role. I would love to revive Hinx in Bond 25. I wanna be a part of it because it’s a historical film. There’s a huge part of me that wants the bragging rights of being that henchman who came back twice, because there hasn’t been many. And I wanna be that guy, I wanna be historical, y’know. Hinx always seemed like he should come back. His demise is not actually shown on screen giving the impression he would return at the end of SPECTRE. Since he did not, the character may have originally been intended to return in Bond 25. The other actor who would like to return in Bond is Léa Seydoux. Of course I would love it. I loved working on Bond, it was actually one of my best experiences. Yes, I would love that but we’ll see. Many fans expected her to return briefly in Bond 25 before being murdered by Blofeld, a la OHMSS. While that may have been the plan at one stage though, Blofeld appears to have once more been abandoned though. And with Blofeld jettisoned, so is that particular storyline. Yep, I’d love to see Léa Seydoux come back, as well! Woof! That would be a first as well, having a major female character return . Works for me !!! I want Eva Green (Vesper Lynd) back. In my opinion, she is the most gorgeous Bond girl of all time. There’s a slight problem with that though.